Lock in a great price for Centro Kubas Angel Boutique Hotel – rated 8.9 by recent guests! The place looks amazing! They have a windmill in the interior court! And the rooms look like a museum room. But with an amazing bed! This was a small issue with the other hotels we stayed at in Lithuania, the mattresses, but here we managed to sleep super well. Plus the bed was huge. The hotel is very well placed, on top of it. The staff is great and warm :) ,and the morning chef was super nice and cheerful. Quirky hotel, which we loved. Indoor balcony which was huge and a great place to relax with a drink in the warm. Nice little kitchen and a very spacious room. Staff were excellent and breakfast very good given the price we paid. All in all a great place to stay in the heart of the Old Town. Location, friendly staff, room had a small kitchens up with a sink, minibar and wine glasses. The staff were very friendly. The included breakfast was abundant. The location was perfect. The breakfast was great, great varieties and taste. Great location in the old city. I arrived from Riga on the bus and walked from the Vilnuis city bus station to the hotel taking about a half an hour. Bus to airport from hotel was 2 minutes away. Staff was very helpful. Their English was not strong, so it sometimes took a while to find the right answer. But they worked hard to please. Breakfast was a mix of buffet and eggs cooked to order. Breakfast was good. I found Vilnuis to be an active vibrant fun old city to hang out in during my 2 night stay. The location is great, centrally located to the center, yet on a quiet street, so no outside noise to interpret sleeping. The staff was very helpful and spoke English very well, they were able to answer all my questions. I did have to ask to have the air conditioning turned on in my room, so the second night was much more pleasant than the first, as it was rather a warm European summer without A/C. Lastly, for European breakfast, I have come to expect very little, but was pleasantly surprised and left feeling full and ready to start each day exploring Vilnius. Lastly, there is a windmill inside, pretty neat. Centro Kubas Angel Boutique Hotel This rating is a reflection of how the property compares to the industry standard when it comes to price, facilities and services available. It's based on a self-evaluation by the property. Use this rating to help choose your stay! 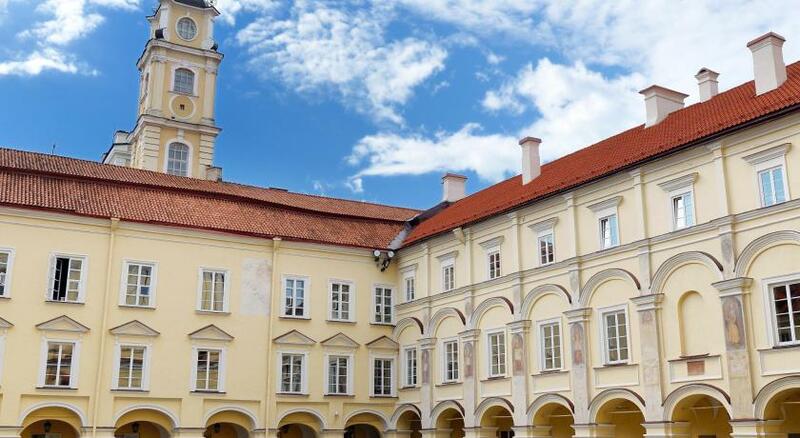 One of our top picks in Vilnius.The Centro Kubas Angel Boutique Hotel is located in the heart of Vilnius in the Old Town, a 5-minute walk away from the Gediminas Castle and the Gate of Dawn. It offers spacious rooms with a mini-bar and free, fast Wi-Fi. Most rooms at the Centro Kubas Angel Boutique Hotel are air-conditioned and decorated with rich colors and wooden furniture. Each comes with cable TV, extra long beds and tea and coffee-making facilities. A varied, Lithuanian breakfast buffet is served in the morning in the stylish breakfast room. A historic windmill can be found in Centro Kubas’ courtyard. Front desk staff is available 24 hours a day and assist with luggage storage and bicycle rental. Guests can benefit from airport shuttle and laundry services. Centro Kubas Angel Boutique Hotel is located a 5-minute walk of the Town Hall and Vilnius University. Private parking is available on site. When would you like to stay at Centro Kubas Angel Boutique Hotel? Elegant room with a mini-bar and cable TV, as well as Wi-Fi. Spacious room with a balcony going out on the hall, and a kitchenette. It comes with an LCD TV. This spacious triple room features unique rustic design and overlooks Stikliai street. Spacious and elegant suite with a bedroom and a living room. It features air-conditioning. Air-conditioned, spacious room with the Old Town views. It comes with an LCD TV. 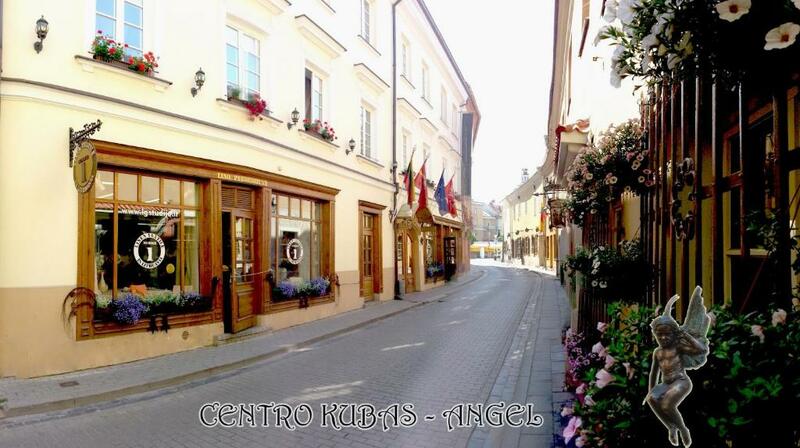 “Centro Kubas – Angel”- a small and homey hotel located in the heart of the Old Town, near the Rotuses Square. It was set up in 01131 on Stikliu Street, once famous for the first manual factory. The very convenient location of the hotel makes the most eminent places-Rotuse, the Cathedral, the Hill of Three Crosses, Gediminas Castle and a lot of museums – be reached within a walking distance. The present day Old Town, included in UNESCO’s World Heritage List, perfectly harmonizes with the features of the contemporary life-style. House Rules Centro Kubas Angel Boutique Hotel takes special requests – add in the next step! Up to two older children or adults are charged EUR 27 per person per night for extra beds. Up to two children from 6 to 12 year are charged EUR 20 per person per night for extra beds. Centro Kubas Angel Boutique Hotel accepts these cards and reserves the right to temporarily hold an amount prior to arrival. It was nothing that we did not like. The breakfast was very good in a small cosy breakfast room. The hotel was in the middle of the Old Town in a tiny charming street. The hotel was very charming and the room in the attic was very quiet. Mirror in the room was in a very awkward place (between wardrobe and desk), so couldn't really use it. I would suggest to move it somewhere else. Really nice small hotel in the heart of the city. Surrounded by loads of shops and restaurants. It had all necessary facilities, friendly staff and nice breakfast. Definitely would be staying again in the future. Interesting design, perfect location in the Old Town and a very good breakfast. Eggs with caviar were the posh restaurant worth. Would recommend to stay there. Good location, clean, excellent baggage store, friendly staff and good value. Really poor breakfast. In breakfast room sits 10 persons but they put out food only for 1 or two persons. Stayed there 3days, all same. Never ever saw something like that. Bathroom floor was so hot that it was impossible to go in there without shoes. The balconies of the interior court were not accessible. Nothing really. Rooms on front can sometimes be noisy at night when people speak loudly in the street. Lovely rooms in cosy building. Very comfortable. The hotel is ideally placed for exploring the old town. I did a few walks with Vilnius with the locals and they started from the town hall which is just a couple of minutes away or the cathedral square which is about 5 minutes walk. The staff are excellent and very helpful reception staff. They arranged a pick up from the airport for me. The breakfast was plentiful and again the staff member who was on when I stayed was great. You could not control the heating from your room, you had to ask at reception and sometimes it was too hot. There was a problem with the chambermaid as she did not clean our buthtub and washbasin for two days. I had to inform at reception. The following day everything was sorted out. the situation was very convinient. Ths reception staff was very helpfulf. The rooms were comfortable. It is five minutes walking from the new City Hall Square and it was situated in a street with a lot of restaurants with very good food. the room was very large, location outstanding with all the sights within walking distance. Staff was nice, provided us with all we needed and printed the boarding pass. The breakfast was a treat I did not expect such a good selection and quality of food in a rather small boutique hotel. All the staff spoke English and Russian.